Beautiful and Extremely Artistic Vintage Scandinavian Ege Art Line Robert Jacobsen Rug, Country of Origin / Rug Type: Scandinavia, Circa Date: Mid – 20th Century – Artist Robert Jacobsen is best known for his abstract paintings and sculptural art. 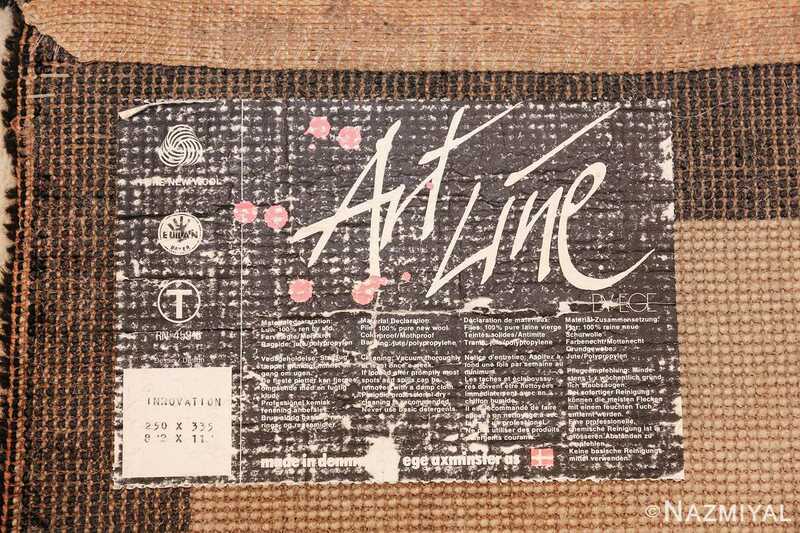 As part of the modernist movement, his artwork creates a new definition of self expression. It focuses on the emotion and the creative process as much as the art itself. 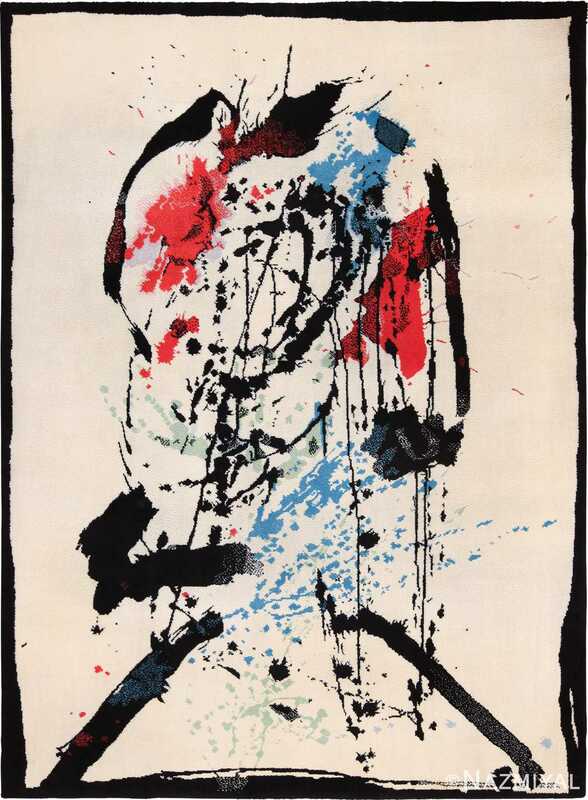 This vintage Scandinavian Ege art line rug appears to be a Jackson Pollock like paint splatter art work, which explains the method used by Jacobsen to create his abstracts. 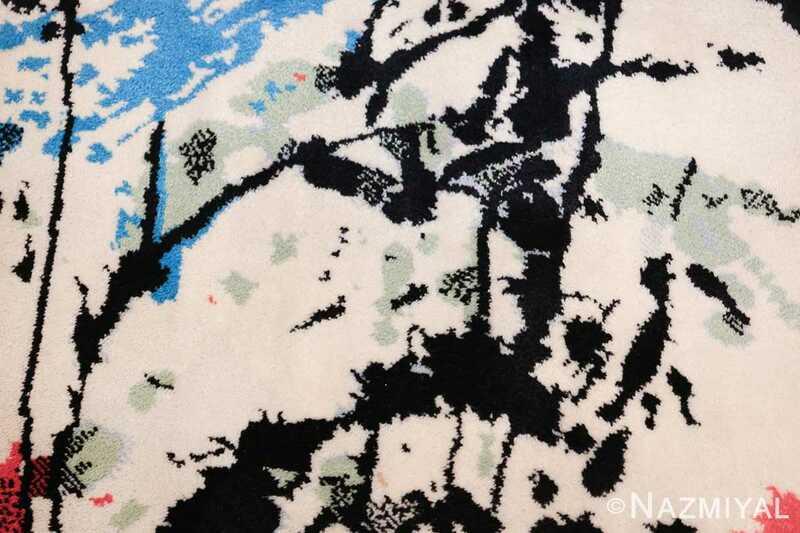 This specific vintage rug was produced in 1988 by Axminster Ege, a leading Scandinavian carpet. 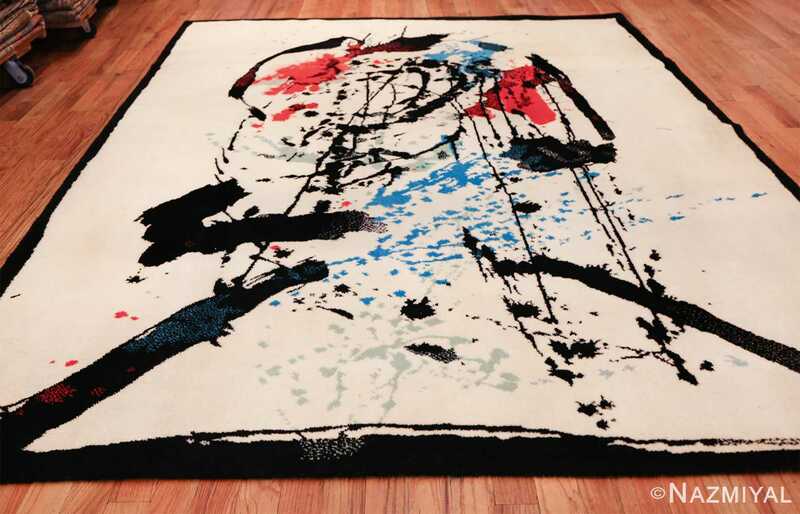 This modern contemporary design rug embodies the spirit of the abstract movement that was popular during the post World War II era. 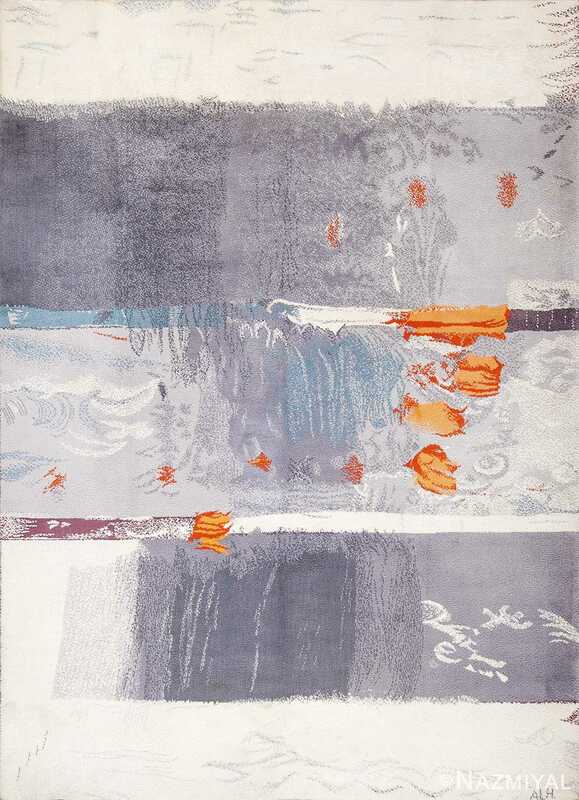 It uses bold contrasting colors and a combination of both broad and delicate paint like designs. The designs are reminiscent of brush strokes that were made using a heavily loaded brush and allowing the paint to drip from the end. 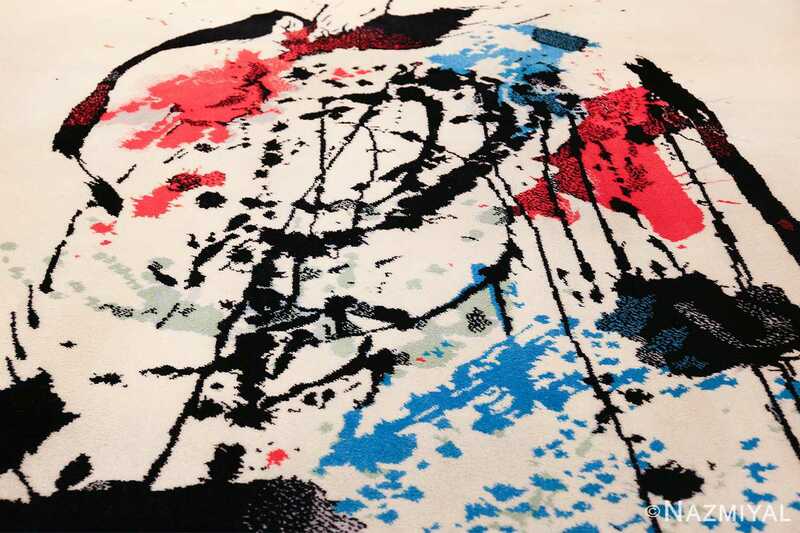 This fascinating art work adaptation creates translates into a rug that is expressive and quite modern in its design. 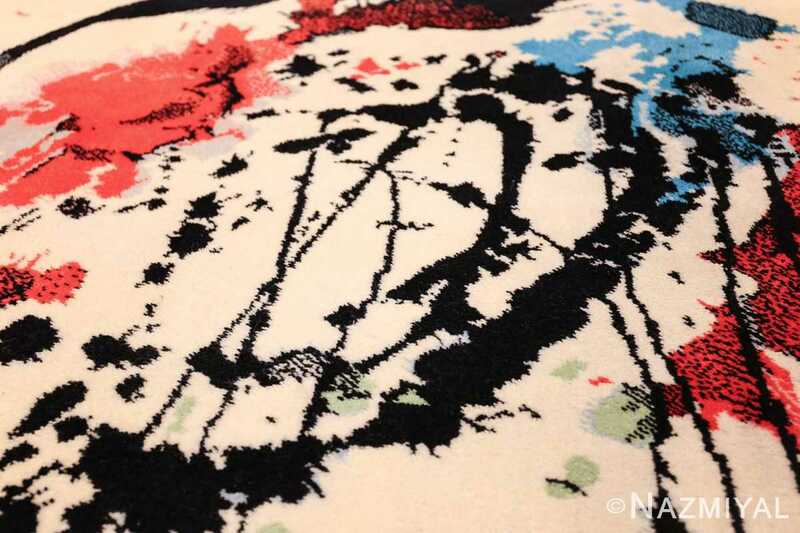 This artistic rug is a fine example of this unique abstract expressionist design process. Jacobsen’s designs use a combination of curves, straight lines and organic elements to create designs that emphasize form and motion. 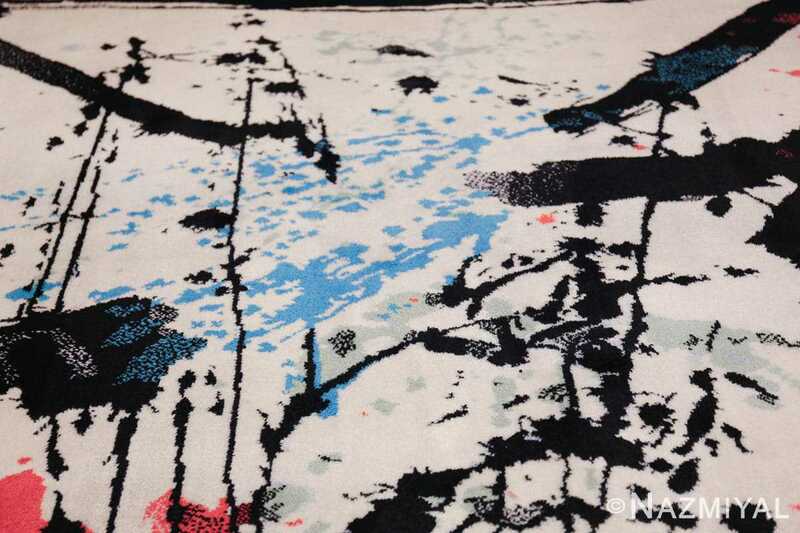 This exciting Robert Jacobsen rug compares the organic design in the middle to the edges of the carpet, which are emphasized by black lines. The “paint drips” serve as the organic element of the design. 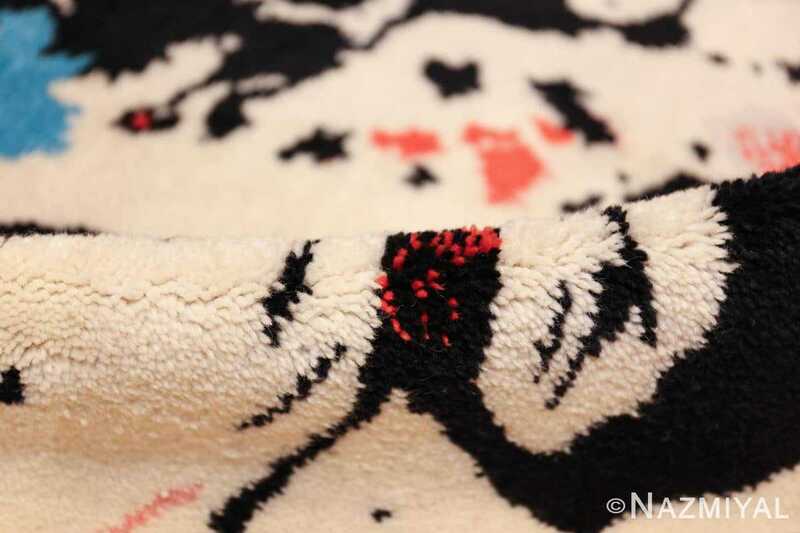 It makes use of the white space through the use of colors that can be easily seen in fine detail. 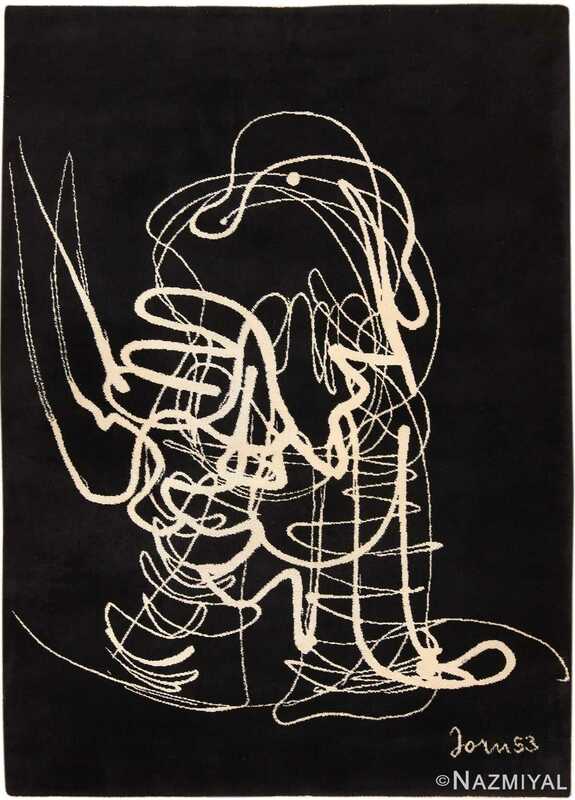 This Robert Jacobsen rug is as intriguing as the artist himself. It makes a bold statement in any modern interior design. Its eye catching use of color adds a bit of pop to any white pallet neutral colored interior design. 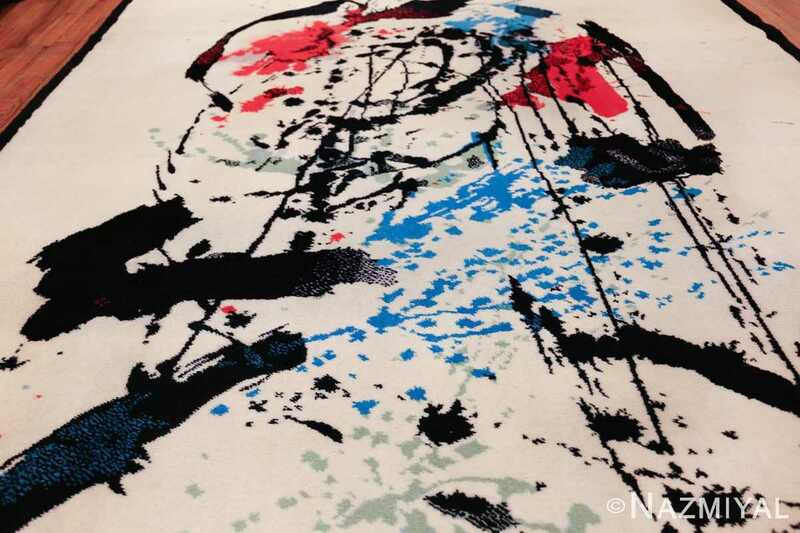 This Robert Jacobsen rug will show off the best features of the room and can serve as a central focal point of the interior design by itself. 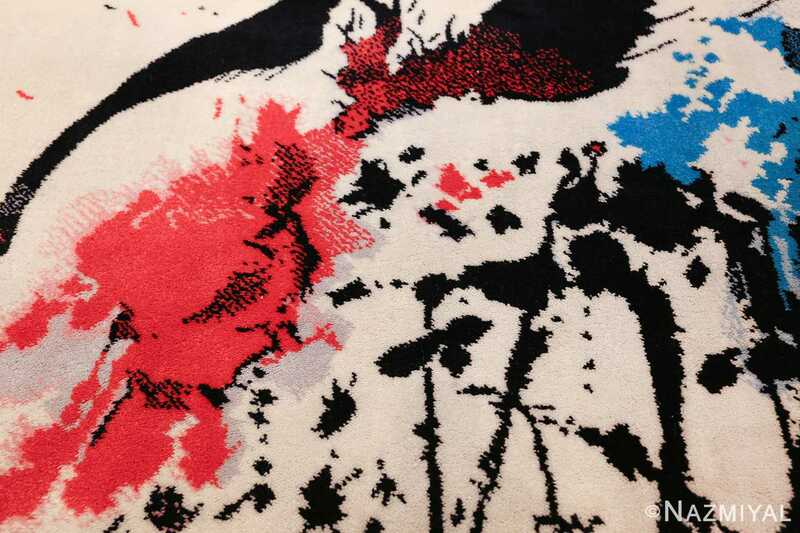 This rug represents an era in design history that strayed away from realism and focused on what it means to be human. 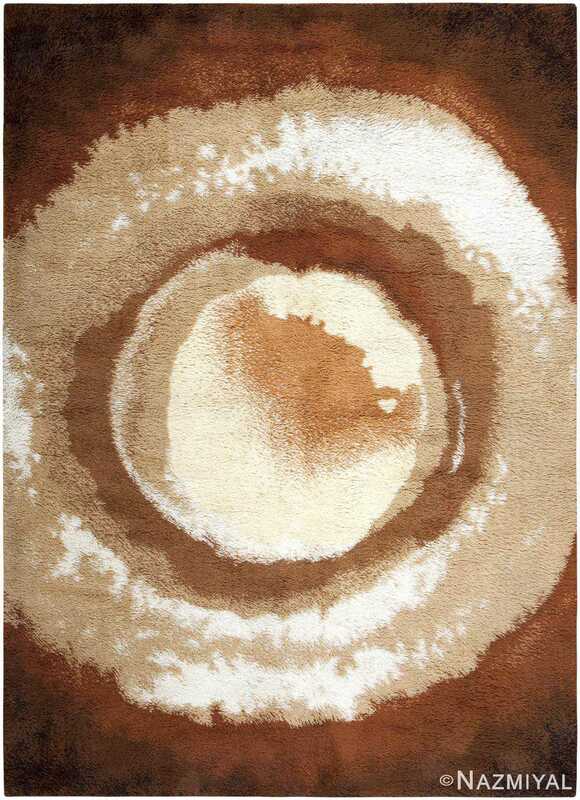 Drawn in a bold minimalist style, this chic vintage Swedish deco rug features an enigmatic abstract medallion composition with robust java browns and frothy whites.